Courtesy of Adam Merrick Real Estate. AWESOME KITCHEN! Sharp 4 BR 3 Full BA home has Open Floor Plan, private fenced yard & 2 Car Garage. The 22×13 Eat In Kitchen was updated in 2016âhigh end cabinets, soft close drawers, Quartz CTâs, backsplash, wood look ceramic tile floor, breakfast bar, & newer SS appliances. Living Rm is 22×15 & off of the kitchen. Master BR 17×13 w/ Full Master BA & large double closets. Walk Out Lower Level has 22×17 Family Rm w/ Daylight window & Fireplace + Office space. 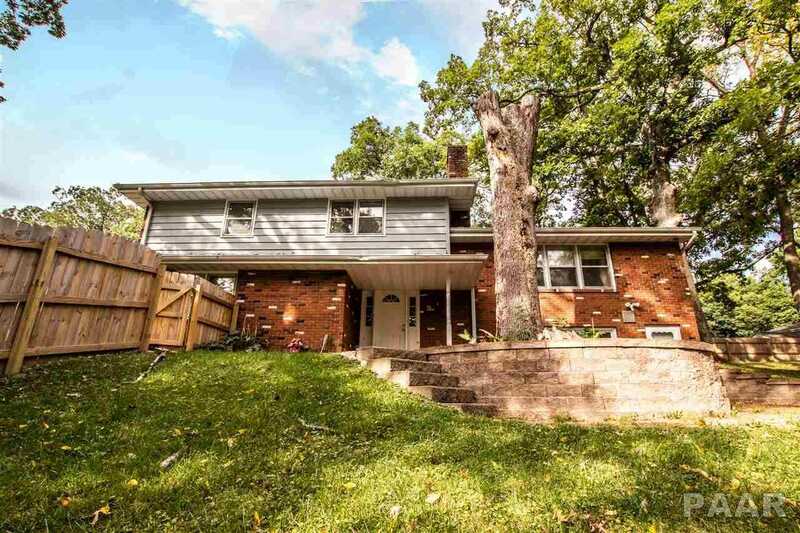 Nearly 1/2 Acre Wooded yard features 18×15 Paver patio, shed & huge 42×30 Basketball Court. Updated bathrooms & handy laundry area. Please, send me more information on this property: MLS# PA1202116 – $154,900 – 2925 W Brookside Drive, Peoria, IL 61615. I would like to schedule a private showing for this property: MLS# PA1202116 – $154,900 – 2925 W Brookside Drive, Peoria, IL 61615.